First announced a year ago, Chucklefish's turn-based strategy game, Wargroove, will finally see the light of day in just a couple weeks... on the Switch, Xbox One, and PC, at least. The title is still coming to the PlayStation 4, but its release date is still TBD. 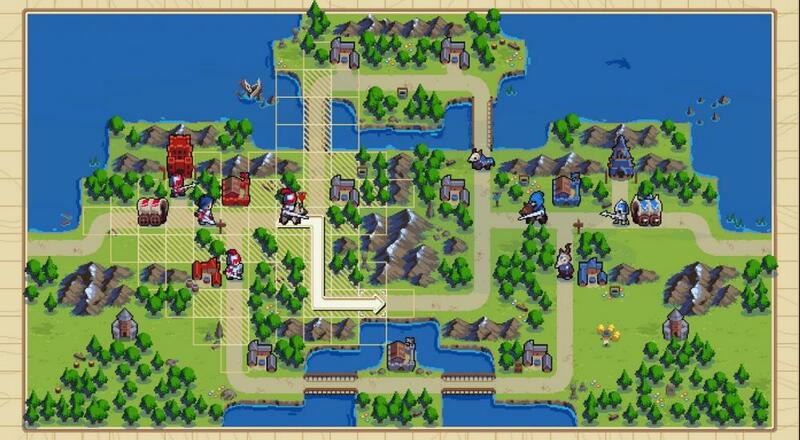 When Wargroove was first shown, it was hard not to draw comparisons between its visual style and gameplay to a beloved RTS franchise that has been dormant for 10 years now - Advance Wars. On the official FAQ page, the developers give a nod to that series, but also emphasize that they are going beyond that. One of the differences they highlight (that is of particular interest to us) is the two to four player online or local multiplayer vis-à-vis the "Skirmish" mode. Like many RTS titles, Wargroove will let you and some buddies team up against A.I. opponents in some old fashioned "comp stomping." The game will also support cross-platform play across the PC, Xbox One, and Nintendo Switch, so you can play with friends regardless of where they decide to pick it up (no PlayStation 4, for now, so perhaps that's the reason for the delay there). Wargroove will be available on PC, Nintendo Switch, and Xbox One on February 1, 2019. The Skirmish mode will support up to three players - either couch or online - against one A.I. opponent (or two humans against two A.I.). Page created in 0.8336 seconds.